Rather than postponing skillful and competent self-sufficiency until the middle or late twenties, Dangerous Children gain the skills to become independent at least 3 different ways by age 18. Most Dangerous Children opt for entrepreneurial training as well as practical skills training, during early to middle adolescence. At this time in North America, welding is one of a number of practical skills that is in great demand in manufacturing, construction, maintenance, and the after-market custom trade. 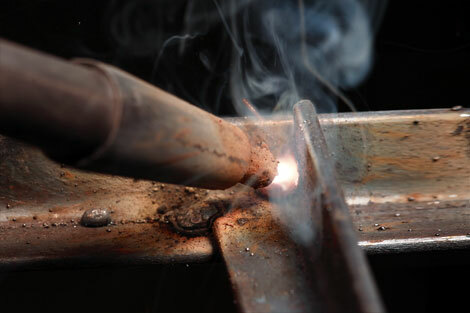 Welding can also be used by artists, for sculpting. The driver of the modern welding renaissance in N. America is the booming oil & gas sector. Children seem to have been drilled with the idea that they must be “successful” and the only way to be successful is to graduate from a college. Even though a college degree does not equate to a graduate who has the ability to read, spell, write, add or even has adequate communication skills to survive let alone advance in any workplaces. How Many Ways Can 18 Year Olds Make This Much Money? A number of years back, educators in the US got the idea that every child should go to college. Vocational programs were dropped from high schools and replaced by ambitious plans to bring every student up to college admissions levels. The deep devastation stemming from that decision continues to build to this day. Thanks largely to the unplanned shale oil & gas boom on private lands, US demand for skilled trades such as welding, electricians, pipe-fitters, etc. is booming across the nation. Each day, 10,000 baby boomers turn 65. More than 2 million skilled workers in manufacturing alone will be needed to replace them by 2018, studies show. Many of those jobs don’t require a bachelor’s degree, but they do demand a skill set that commands good pay, said Jan Roeser, an economist for the Idaho Department of Labor. Thanks to the North American energy boom, manufacturing is beginning to return from overseas locations, pushing the job demand estimates mentioned above even higher. Some of the best welders are self-taught or learned by apprenticing, but it requires a lot of careful practise to master the craft however one learns. If your child has access to a high school welding class, suggest that he plan to enroll, if he is at all interested. San Jacinto College in Pasadena, Texas, offers a four-hour welding class in the middle of the night. … local employers say they’re worried there won’t be adequate supply of workers of all kinds. Just for construction, Gulf Coast oil, gas and chemical companies will have to find 36,000 new qualified workers by 2016, according to Industrial Info Resources Inc. in Sugar Land, Texas. Regional estimates call for even more new hires once those projects are built. Obama is intentionally trying to kill US coal, nuclear, offshore oil, and public lands oil & gas. The only reasons that the US oil & gas boom continues is that it is taking place on private lands, and it took the Obama administration by surprise so that it was unable to kill the industry in its cradle, quickly enough to prevent political backlash. Rather than going to college, most kids need practical skills and competencies to make a living and live a balanced and independent life. But that goes against almost everything that the modern skankstream in media, politics, and academia represents and champions. Perhaps it is time for a powerful shakeup at the highest levels of society? As long as political forces refrain from killing US energy production, the outlook for young welders, electricians, pipefitters, plumbers, fabricators, robot operators, and other vocational tradesmen should remain bright. Unfortunately, Obama has opened the door to the green lefty-Luddite dieoff.orgiasts both inside and outside of government. Watch them closely. The summer camp and Boy Scouts approaches merely provide an introduction to practical skills for youth. Apprenticeship programs provide a much more extensive training. The answer is no. If she wants to, fine. But she probably won’t, and there’s no way to force her. Try to force her (for example, by setting up a demanding core curriculum), and she will transfer to another school, because she is in college for vocational training. She wants to write computer code. Start a business. Get a job in television. She uses college to take vocational courses that pertain to her career interests. A large proportion of people who are theoretically able to absorb a liberal education have no interest in doing so. Your high school may not have adequately prepared you for college-level academics. I am a college professor at a good quality satellite campus of State University. I have been teaching here for 38 years and it’s been clear to me for all that time that some (not most) students do not belong in college. You are correct in that many of them are ill prepared for college. They lack essential academic skills and either do not have the necessary desire to acquire them in college or lack the mental ability. The latter group have been passed forward through a school system that has failed to realistically assess their abilities. If you don’t finish, it’ll be a waste of time. You’ll incur a lot of debt. Even the few students who don’t incur a lot of debt usually pay too much for too little (i.e. much of college education today is merely a bestowal of politically correct jargon and therapy – is this worth thousands of tuition dollars?). We are, in other words, spending too much on too little. This phase of the student loan crisis is a collective declaration by the markets that a college education in its prevailing form is overvalued and overpriced. The next phase may be a harsher judgment on the institutions that fail to heed the warning. And any college or university that is now licensing the sustainability zealots to indoctrinate students in the residence halls or the classrooms is making a doubtful guess about its future. You’ll delay your opportunity to earn income. You can get a great, well-paying job without going to college. While some educators propose a radical renovation of the community college system to teach work readiness, Professor Lerman advocates a significant national investment by government and employers in on-the-job apprenticeship training. He spoke with admiration, for example, about a program in the CVS pharmacy chain in which aspiring pharmacists’ assistants work as apprentices in hundreds of stores, with many going on to study to become full-fledged pharmacists themselves. Yet all in all, we see open education as a more or less beneficial trend, similar to Wikipedia. It may not possess the scholarly qualities of the original but it is helpful when you need it. And while most of our members prefer the traditional classroom setting, we do think education should be accessible to every curious person who wants to learn. College culture can produce toxic habits in a young adult (i.e. binge drinking, hooking up, etc.). As a result, feminism has played a large part in the continued rise of the hookup culture and decline of traditional dating on campus. Hooking up—engaging in a physical relationship with no intention of forming an emotional relationship—can be especially dangerous for women. Aside from the risk of pregnancy, women are more likely than men to contract sexually transmitted diseases, which can potentially cause infertility, cancer, and even death. When higher education is for everyone, it loses its “higher” qualities. But do we really want to do to higher education what we have to K-12 education? The prospect would seem to be of a system of derisory standards and profound institutional decline. We might achieve the hollow boast of the most college-credentialed citizenry in the world who also happen to be among the worst-educated. New Manpower Report describes talent and skills shortages in power and energy industries, among others . . . This entry was posted in Education, Technology and tagged Dangerous Child, jobs for youth, vocational training. Bookmark the permalink. From a manufacturer’s perspective, welders are in super high demand if they are willing to work outdoors. It has gotten so bad that we are purchasing robot welders, not that we want to get rid of human welders, it’s just that we cannot keep them around and the skilled ones are few and far between. Son has had two days off in the past 8 weeks, and his days are 12 hours long or longer. The hours are hard on his relationships and family life. OTOH, he has plenty of money to buy new stuff when a girlfriend gets tired of waiting for him and moves out and takes all his stuff with her. Exactly. Work income needs to be converted to income from capital and/or income from a self-sustaining business. Having a good income from your personal work is not enough. One must transition onto firmer foundations, with multiple backups. I know high income surgeons and executives who are in debt to their gills, and always will be. Kids will be kids, of course, but if we keep allowing popular culture to define how kids and young adults are supposed to behave, we are in for an Idiocracy of a Dark Ages. Hazardous occupations often draw higher compensation than waitressing, secretarial work, or serving as a cashier in a Target store. The higher pay is what draws men to the work, and the hazard is what repels women from doing such jobs.